On this self-guided walking holiday to Andalucia discover the mountainous area of Sierra de Grazalema. Explore the sculpted limestone hillsides and historic white- washed local villages. Walk through shady olive groves, woods of cork oak trees and Spanish fir forests. Meet your taxi at Ronda bus station and drive to the 'Pueblo Blanco' (whitewashed village) of Grazalema. Here, in the foothills of the Sierra del Pinar Mountains, your hospitable and characterful hotel will be your base for the next three nights. Today's walking route takes you through a classic limestone landscape dotted with 'cortijos' - traditional farmhouse complexes found across the countryside. You'll traverse through lovely woods of evergreen oaks and typical Mediterranean vegetation on your way to Benaocaz - an untouched 'Pueblo Blanco' with historic remains dating back to Roman times. The village sits perched on a hill, with sweeping views all around. From here, you will transfer back to your hotel in Grazalema. You can expect today's 12 kilometre walk to take approximately five hours. Today, you have a choice between two circular routes in the area around Grazalema. Both walks offer lovely views among the striking combination of red earth tones and green vegetation. Because neither walk is particularly lengthy, you may choose to do both. This afternoon, there is time to relax in Grazalema. You may choose to explore the small shops in the village, or enjoy a refreshing drink on an outdoor terrace. You can expect today's 5 and 4 kilometre walks to take approximately three hours and one-and-a-half and, respectively. This morning starts off with a 20-minute taxi transfer to the village of Villaluenga del Rosario - home to a unique 'square bullring' carved right out of the rock. From here, you descend into the bucolic valley of Llanos del Republicano, where the river disappears mysteriously into a limestone sink. Next, your route takes you uphill, along sculpted cliffs in the Sierras de Libar and el Palo, to reach another jewel of a town - lovely Montejaque. After a refreshing drink, you have the option of taking a taxi to your next hotel base in Benaoján, or continuing here on foot. Your hotel for the next three nights is positioned on the edge of the hamlet, with beautiful views of the surrounding countryside. As well as boasting an outdoor swimming pool, it also offers a great restaurant, serving locally-produced food. You can expect today's 18 kilometre walk to take approximately six hours. Today's route begins with a 10-minute walk to the train station for your 10-minute train journey to Jimera de Libar. From here, your scenic walk takes you through the beautiful Rio Guadiaro Valley, all the way back to your hotel. You can expect today's 9 kilometre walk to take approximately three hours. This morning, you will walk to the nearby Cueva de la Pileta - a cave with surprising formations and prehistoric paintings, which we recommend taking time to explore. On your way back, you can either make a detour to have lunch in Montejaque, or return directly to your hotel to enjoy lunch by the pool. Depending on which route you take, you can expect today's 6.5 and 6.4 kilometre walks to take approximately two-and-a-half and three-and-a-half hours, respectively. Today's rural route sets out along a section of ancient cobbled path. After passing through fields and past characterful family farms, you reach the end point of the trip - Ronda. Widely regarded as one of the prettiest towns in Andalusia, its intriguing mix of Moorish and European monuments is captivating. Established in the 9th century BC, Rhona is also one of Spain's oldest towns and its history is palpable. Tonight's conveniently-located hotel provides an ideal base from which to explore the town. You can expect today's 11.5 kilometre walk to take approximately four-and-a-half hours. Light rainwear may be needed at any time of the year, and a warm fleece/ jacket is recommended for cooler evenings and nights early and late in the season. We'd recomend flying into and out of Malaga or Seville. Malaga is served by budget (including Easyjet and Ryanair), charter (including Thomson Airlines) and scheduled airlines (including British Airways) from many UK airports. Seville is served by fewer airlines, mainly from London airports, but these include Easyjet, Ryanair and Iberia (non- direct). At the start of your trip you can fly into Malaga or Seville. From Seville airport to Seville Santa Justa train station (city centre) - Line EA. Every 30 min. between 05.20 and 01.15. Duration approx. 20 minutes. Seville Prado bus station is 5 -10 minutes. Alternatively there are taxis. On the day, once you know your arrival time, please call the taxi driver to arrange meeting at either the bus or train station in Ronda. On departure these journeys are reversed. On this journey you walk for between 2.5 and 6.5 hours on 6 days, mainly on unsurfaced trails and footpaths. 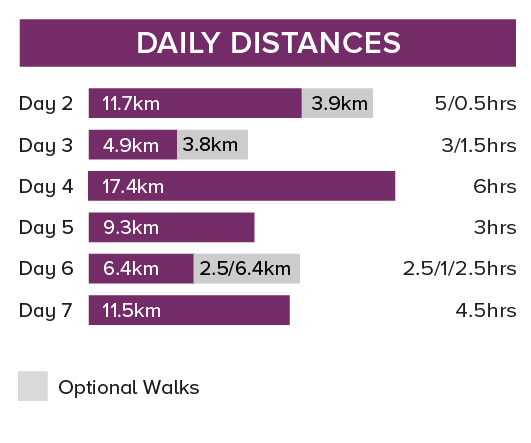 The distance covered is a minimum of 64 km (an average of 10 km per day). Sat 23 Mar 2019 - Sun 28 Apr 2019 Your trip can depart anytime between the above dates. Contact us for triple room requests and solo traveller prices. Mon 29 Apr 2019 - Sat 15 Jun 2019 Your trip can depart anytime between the above dates. Contact us for triple room requests and solo traveller prices. Sun 1 Sep 2019 - Sun 22 Sep 2019 Your trip can depart anytime between the above dates. Contact us for triple room requests and solo traveller prices. Mon 23 Sep 2019 - Fri 25 Oct 2019 Your trip can depart anytime between the above dates. Contact us for triple room requests and solo traveller prices. Thu 12 Mar 2020 - Mon 23 Mar 2020 Your trip can depart anytime between the above dates. Contact us for triple room requests and solo traveller prices. Tue 24 Mar 2020 - Tue 28 Apr 2020 Your trip can depart anytime between the above dates. Contact us for triple room requests and solo traveller prices. Wed 29 Apr 2020 - Mon 15 Jun 2020 Your trip can depart anytime between the above dates. Contact us for triple room requests and solo traveller prices. Tue 1 Sep 2020 - Wed 23 Sep 2020 Your trip can depart anytime between the above dates. Contact us for triple room requests and solo traveller prices. Thu 24 Sep 2020 - Wed 30 Sep 2020 Your trip can depart anytime between the above dates. Contact us for triple room requests and solo traveller prices. Thu 1 Oct 2020 - Wed 28 Oct 2020 Your trip can depart anytime between the above dates. Contact us for triple room requests and solo traveller prices.